Call centres have evolved into omnichannel contact centres. It’s no longer acceptable to route customers and interactions into an inefficient siloed environment. Gain a competitive edge by blending resources and prioritising interactions across all channels. Create an effortless customer experience by leveraging context to choose the best resources while providing the customer profile and journey context to the resource who receives the interaction. Choosing the best resource for each interaction drives desired outcomes for your customer and your business. Intelligent automated routing is fundamental to provide a true omnichannel customer experience. 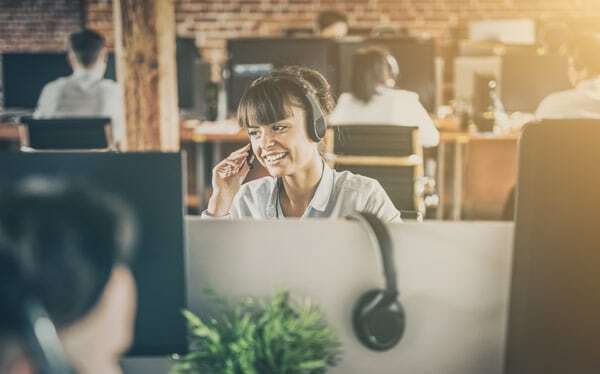 In a traditional, siloed call centre world, disconnects in communication between channels and resources frustrate your customers. These disconnects lead to transfers and force customers to repeat themselves. If customers encounter that type of extra effort, it increases frustration and deteriorates loyalty. In the best case, you end up with an unhappy customer. In the worst case, you lose the customer. Dynamically connect each interaction—from any touchpoint, over any channel. Every interaction is prioritised in a universal queue that’s based on your business rules. This ensures your resources work on top-priority interactions to drive your business outcomes. Predictive routing harnesses the power of your data to take your business to the next level. Through modelling and machine learning, predictive automated routing drives the business outcomes that you define as important. Whether you aim to improve customer satisfaction, increase efficiency or drive revenue, you choose the model that determines the best agent to propel your business outcomes—for each interaction and each area of business. And you can select different models for different teams to maximise your results, and make changes as you need. Having these options increases personalisation capabilities, reduces handle time and improves first contact levels. Every customer is different. Accommodating customer segmentation needs and meeting acceptable service levels requires the flexibility to adapt to changes in demand across your environment. Leverage our rules-based automated routing to set the necessary parameters for coverage and prioritisation. 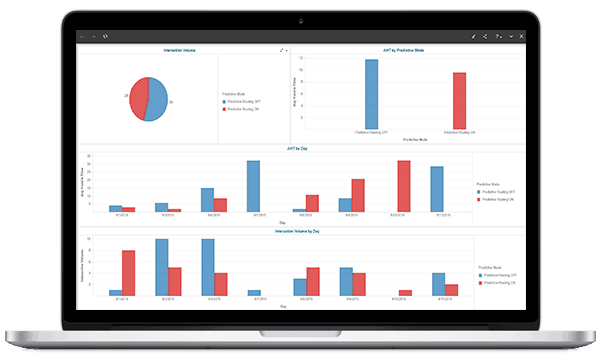 With dynamic target expansion, your system evaluates available agents, service levels and other factors in real-time to expand and contract targeted resources and meet defined business objectives. Manually moving agents from one queue to another to meet demand is a thing of the past. Drive relationships and reduce customer effort with “last agent” routing, connecting your customers with the person they last interacted with, if needed. Traditional queue-based routing is static, siloed and inflexible. And it makes it difficult to fine-tune your business rules or adjust to changes in demand. Often, you need to rely on IT teams to make even minor changes. It doesn’t have to be this way. Intelligent automated routing reduces operational effort through easy-to-use business rules that reduce the need for technical coding. Dynamic target expansion removes the need for real-time queue monitoring and manual agent re-skilling. And leveraging data and context to connect the right interaction with the right resource further drives business outcomes and customer satisfaction. Use a universal queue of interactions across channels to assure your teams work on the most critical tasks at the most critical time. Omnichannel routing is foundational to delivering the seamless, consistent, personalised engagement that customers now expect. With the Genesys PureConnect™ and PureEngage™ platforms, you have a routing engine driven by over 25 years of continuous development. Remove the limitations that siloed queues impose on your customers and your business. Enable effortless experiences across all customer journeys. Gain the advantage of a data-driven, rules-based approach that goes beyond single interactions to manage related interactions over time and handled in parallel. Predictive matching works harmoniously with routing to drive your marketing and sales campaigns to new heights of success. Harness the power of your data and drive the business outcomes that you define as important to take your sales and marketing efforts to the next level. Increase personalisation capabilities, reduce handle time and improve first contact levels by leveraging big data and business rules to predict the optimal representative to deliver the most compelling offer. Continuously improve the process of matching your customers to representatives by predicting outcomes using modelling and machine learning. Omnichannel routing is foundational to delivering the seamless, consistent, personalised engagement that customers now expect. With the Genesys PureConnect and PureEngage platforms, you have a routing engine driven by over 25 years of continuous development. Remove the limitations that siloed queues impose on your customers and your business. Enable effortless experiences across all customer journeys. Gain the advantage of a data-driven, rules-based approach that goes beyond single interactions to manage related interactions over time and handled in parallel. Dynamically match every customer interaction from any touchpoint over any channel with the optimal agent. By leveraging customer profile and context, omnichannel routing ensures that customer conversations continue without interruption as they move from touchpoint to touchpoint. Enable customers to shift from digital channels, like mobile and web, to human voice interactions, all the way through to back-office fulfilment. And, as the customer interaction progresses through the journey, the next resource in line is presented with all the information needed to understand the history, context and next steps to guarantee the best customer experience. Capture interactions and work items on any channel, from any location, to unify self-service and assisted-service. Evaluate context to recognise journeys, segment customers and personalise routing treatment. Eliminate planning to determine skill combinations used in routing and time spent re-assigning agents to queues as workloads fluctuate. Execute next-best actions, including routing to the next available resource. Manage a single platform with unified workforce optimisation, an omnichannel desktop and end-to-end optimisation. Increase personalisation across voice, digital and mobile. Improve first contact levels by predicting the optimal representative. Continuously improve the process of matching customers to optimal endpoints, either employees or self-service, with machine learning. Predictive routing ranks each representative based on any number of criteria, including customer profile, interaction profile, desired business outcome and agent profile. These metrics are overlaid with the representative’s existing skills and proficiency matrix used for scheduling. Then, that data is combined with the multidimensional skill profile using a patented method that delivers the interaction to the best possible representative or endpoint. And because predictive routing leverages your data, you have complete visibility into the predictors and the data used to drive your business outcomes. Predict: Quantify the untapped opportunities and potential gains. Start small: Pick a group and business goal to start. Go big: Fine-tune and deploy the practice broadly across your organisation. Current tools can handle the complexity of business rules and KPIs—but they only go so far. An omnichannel environment makes routing exponentially more difficult without automation and/or the ability to harness the potential of machine learning. Overcome the challenges of traditional queue-based routing while gaining measurable increases in productivity, revenue and efficiencies. Use AI to match customers to the best agent at the right stage of their journey to improve customer satisfaction and loyalty, while optimising operations.